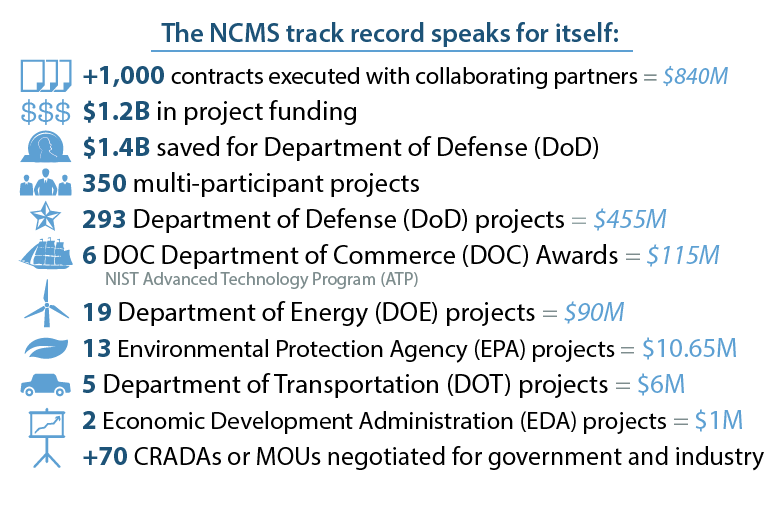 The National Center for Manufacturing Sciences (NCMS) is a cross-industry technology development consortium, dedicated to improving the competitiveness and strength of the U.S. industrial base. As a member-based organization, it leverages its network of industry, government, and academia partners to develop, demonstrate, and transition innovative technologies efficiently, with less risk and lower cost. NCMS enables world-class member companies to work effectively with other members on new opportunities – bringing together highly capable companies with providers and end users who need their innovations and technology solutions. NCMS members benefit from an accelerated progression of idea creation through execution. At NCMS, collaboration is more than just a word, collaboration is what we do! Our collaborative model has resulted in contracts valued at more than $840 million. NCMS was formed in1986 to strengthen North American manufacturers and respond to global competition. The balance between long-standing experience and fresh innovation requires a unique intersection of highly capable companies, access to efficient, effective contracting vehicles and relationships built on credibility and trust. Through NCMS, companies with innovative technologies can collaborate with end users and develop solutions to meet their requirements. NCMS has long-established relationships, a stellar reputation, and credibility among end users. Coupled with our collaborative power to partner small R&D companies with top-tier OEMs, the results are innovations and opportunities to develop and refine and provide user-centric solutions.